...Competition for chemical technician positions is intense. Lauren Gaskell, who has a master’s degree in pharmaceutical sciences, decided to become a chemical technician because she loves working in the lab. After looking for a job for more than a year, she recently found a temporary position as a chemical technician at a company in Boston. Despite the demand, Allen says Aegis will rarely consider someone with a master’s or Ph.D. for chemical technician positions. “We do our best to follow up with candidates to help direct them to the positions that would be more suited to their education level and experience,” she says. Bachelor’s-level chemists often see the chemical technician position as a way to get their foot in the door. After receiving her bachelor’s degree in chemistry, Samantha Fisher searched for a job for eight months. Aerotek helped her find placement as a technician at a biotech company in Maryland. After six months, Fisher was hired on as a permanent employee. This new website, Synvaluate, is very interesting -- basically, it's an review site for synthetic procedures. [UPDATE: redacted] I like the graphic style that I've seen so far. Quintus is reviewing some procedures, which is exciting. It will be interesting to see how the latest crop of post-publication review sites (e.g. PubPeer, SciBase) will work over time and which one will develop a large enough following (all of them?) to sustain a community and generate enough funds somehow to pay for server space, etc. In any case, best wishes to Synvaluate! Subsequently, as a Ph.D. student at Purdue University, I was exposed to the challenge of fundamental research, which led me to a 43-year career in research and teaching at Wayne State University. I encountered many students who became enthusiastic about chemistry during their undergraduate years, particularly those who engaged in real research projects. For me, an ideal 21st-century chemistry set would provide materials that students can apply to their everyday environment. Even the best-designed canned experiments will not always excite an inquiring mind. I wonder if Ford hires B.S. chemists anymore? And if they do, whether or not they give them as much responsibility as Dr. Rorabacher seemed to have? Neat story. This mechanochemistry story by Beth Halford is disappointing news -- good to know it's being corrected. Jeff Johnson reports on congressional and managerial turmoil at the Chemical Safety Board. Non va bene. This Editor's Page column by Rick Mullin on poetry was truly unexpected. Han, 57, was indicted last week on four counts of making false statements, according to the indictment filed in federal court, and each count carries up to five years in prison, according to the news service, which adds that Han did not respond to calls for comment. The episode is attracting attention for a couple of reasons. For one, the research was considered very significant at the time and pumped up the scientific community about the possibilities of a breakthrough. Moreover, experts say it is unusual for the feds to file charges in situations where scientists have falsified data. “It’s an important case because it is extremely rare for scientists found to have committed fraud to be held accountable by the actual criminal justice system,” Ivan Oransky, a physician and journalist who is co-founder of Retraction Watch, which tracks research misconduct, tells the AP. I can't say that I feel very sorry for Dr. Han, although I am rather surprised that he's being brought up on federal charges. This is a topic that’s relevant to my interests because of where I grew up, in a small town in central New York state, during a time when the local industries were all packing up and moving away. I’ve seen a lot of people struggle with this– when I was a kid, it was a rare year that we didn’t see a classmate or two move away as IBM (the biggest white-collar employer in the area) shifted most of its operations to North Carolina– they moved so many people from the Binghamton area down there that in the mid-90′s, you could find Salamida’s Spiedie Sauce in Food Lion supermarkets on the Outer Banks). And now, the high school classmates I’m in contact with on Facebook are spread over a huge range, many down South, but a lot still in the Broome County area. I wonder if one of the differences between the corporate restructurings of the Nineties and the pharma layoffs of the 2000s was that the pharma jobs went to China, as opposed to moving within the United States? This was pretty fun, and pretty funny. But I should say that it was 99.5% my coworker's ideas and efforts. ...The DA’s office didn’t negotiate a deal with Harran until after his preliminary hearing to ensure there was a public record of what happened in the accident, says head deputy DA Craig W. Hum. ...As part of the community service mandated by the agreement, Harran must develop and teach an organic or general chemistry course for the South Central Scholars, a volunteer organization that helps prepare Los Angeles inner-city high school students for college and graduate school. The DA’s office worked with the organization to put together a project that would be “enough of a drain on Harran’s time and energy to be a significant punishment while giving a huge benefit to the organization,” Hum says. Harran must also complete 800 hours of community service in the UCLA hospital system. This service cannot involve teaching, and could include jobs such as delivering food to patients. “We wanted him to do something outside of his comfort zone,” Hum says. ...Overall, Hum says he understands the Sangji family’s position that the agreement is inadequate. But he also thinks that the settlement is likely close to any sentence that Harran might have received had he been convicted. “There was no way that any judge was going to punish him by sending him to jail,” Hum says. There are likely lots of policy reasons that someone convicted of labor law felonies would not be sentenced to prison (i.e. California criminal justice budgets are tight, and prison is ~reserved for violent offenders. *) Also, I'd be curious to know if judges are subject to the same prejudices that bloggers are: that "professors who make serious and irresponsible mistakes are too nice and of the wrong socio-economic status to go to prison." UPDATE: An extra tidbit about Harran's potential teaching duties. Note that they say "the syringe she was using malfunctioned." That is an unsupported assertion. Ashton Scientific requiring short online review of paper in order to interview for a position? Thank you for your note and your interest in Ashton Scientific. After further review, we'd like to invite you to continue the interview process. You do not need to choose a paper that is already on the list - you can add a new paper and then review it. Reviews will be judged on clarity, informativeness, inclusion of experimental results, and provision of useful recommendations. Positive as well as critical reviews are encouraged. (For a simple example, see http://scibase.co/listings/index/l/133655) You can post under your own name, or – if you prefer – can post anonymously, but in either case, please e-mail me the URLS of your reviews. After you have emailed back the URLs, we will examine your reviews and based upon that select candidates for phone interviews. We will judge candidates based upon the quantity and quality of reviews, and ask that the reviews be completed in the next 7 days. What is the relationship between Ashton Scientific and SciBase? Their websites certainly look similar, but that doesn't mean anything. Who are the other chemical companies that are doing this? Does Ashton Scientific make money on SciBase's reviews/hits? Could they in the future? If Ashton Scientific does indeed make money of SciBase, isn't this requiring free work of applicants? Why did C&EN put in the resources to follow this case so closely for so long? Because we believed that no one could properly learn from the incident unless they knew the details of what happened. I find it more than a little disturbing that people at UCLA–and apparently even lab safety officers at UCLA–do not know the correct details and try to write off the incident as someone who should have known better making poor choices behind her adviser’s back, alone at midnight on a holiday weekend. That’s not what happened. Great questions. Read the whole thing. In our lab, on the first day a new member starts, they are expected to read (and sign) over *a hundred* SOPs (standard operating procedures), each of which is often over ten pages long. How many people do you think read a thousand pages of technical material on that first day? Nobody has, and nobody ever will. Next up is the $40,000 “Laboratory Safety Fundamentals” online video. All you have to do is skip to end of each video and answer a multiple choice quiz. You’ll get it wrong the first time, but it will tell you the right answer. Load it up again, and in 10 minutes you are finished without a single thing learned. My supervisor was actually pretty good about pointing out the safety shortcomings of our group. The real problem? He was never around. What I never saw happen was another student point out where a peer wasn’t behaving safely. Yes, everyone wears PPE now – but only because we don’t want to be blamed when the lab gets fined. This is a fundamental problem of online safety training -- it's not very engaging. I don't know what to do about it. Maybe a version of ORI's interactive movie "The Lab", but oriented to bench-level laboratory safety (rather than research ethics) would be the way to approach the issue. PIs: what do you think of the outcome of the #SheriSangji case? If you're a principal investigator, especially in the University of California system, what do you think of the outcome of the #SheriSangji case? Want to write about it? How do you feel about Professor Harran's treatment at the hands of the media, online commenters or his administration? If so, I'd be happy to post your comment, anonymously and unedited. I guarantee anonymity/pseudonymity. E-mail me at chemjobber -at- gmail-dot-com. The most important aspect of the Harran deal is how it extends the long, proud tradition of excusing PIs of any professional responsibility for their work. Society recognizes that professors are only supposed to have good things happen to them. We get the lion’s share of credit for papers, not the students or postdocs. We get the big salaries, not the students or postdocs. We get the awards, not the students or postdocs. On the flip side, professors must be protected from negative consequences at all costs. If an accident happens in one of our labs, that’s the students’ fault. If multiple papers from one of our labs contain fabricated data, that’s the students’ fault as well. Clearly, professors are not responsible for supervising their groups for integrity or safety. We know this because Dalibor Sames and Patrick Harran are still in charge of their labs. I applaud Columbia and UCLA for recognizing that you can’t discriminate against professors for trivial things like irresponsibility and incompetence. Anyway, it’s the competent professors you need to watch—lightning never strikes twice, right? Of course, I realize that there should be some consequences when something truly horrible happens. In these situations, professors must arrange for perfunctory punishments that allow all of the parties charged with oversight to save face. That’s what we saw here: UCLA threw some money at a scholarship in the victim’s name and at establishing a safety program it should have had in the first place. Personally, Harran was forced to donate money to the hospital where his student died. Incidentally, I think $10,000 was way too much; the man only earns $301,000 a year. How is he going to make ends meet with just $291,000? At least Harran’s lawyers were clever in how they disguised the 800 hours of community service as a major inconvenience instead of court-mandated preparation for the Broader Impacts section of Harran’s next NSF proposal. Killing two birds with one stone is exactly why good lawyers get paid the big bucks. My post is going to be up later, but it's interesting to see what people are thinking so far. I don't think anyone thought that there would be a trial, and here we are. Details as they break. ...Harran, charged with four felony counts of willfully violating state occupational health and safety standards, had faced up to 4-1/2 years in prison if convicted. $10,000? That seems kind of low, but I don't know what California law is for that. ..."No words can express the sympathy I have for Sheri’s loved ones. As a father myself, I cannot imagine the pain they have and will continue to endure," Harran told the court. "What happened to Sheri in my laboratory was absolutely horrible — and she was too young, too talented and had too bright a future for anyone to accept it … I can only hope that, if not today, perhaps someday they can accept my deepest condolences and sympathies for their loss." Interesting how this reflects some of what Janet Stemwedel suggested a while back. 1. For purposes of this Deferred Prosecution Agreement only, Defendant Harran acknowledges and accepts responsibility for the conditions under which the laboratory was operated on December 29, 2008, as set forth above. 2. Neither Defendant Harran, nor any of his counsel or representatives, will make any public statement denying responsibility for the conditions under which the laboratory was operated on December 29, 2008. Also, the South Central Scholars commitment is pretty bulky. UPDATE 5: I should note my condolences to the friends and family of Sheri Sangji -- this must be a really hard day/week for them. Sangji’s family was deeply disappointed with the deal. “We do appreciate that he’s serving some punishment, but it doesn’t go far enough,” Naveen Sangji, Sheri’s sister, told the Star after leaving the courtroom. The judge doubled Harran’s community service hours at the family’s request, she said. UPDATE 9: Here's Jyllian Kemsley's timeline/article round-up. I know that it's tempting to consider "getting some experience", "building your network" and the like, but reputable chemical and pharmaceutical employers pay* for services. If you're an entry-level scientist and a potential employer says "You know, we would be happy to have you on as a volunteer and we would hire you on later...", DON'T DO IT. If they say "You know, we're a startup and we can't pay you, blah, blah, blah", DON'T DO IT. Obviously, we could have a rollicking conversation about unpaid internships (and their legality), summer studentships, volunteering and the like. But this PSA is aimed mostly at younger people who are looking for full-time positions and are getting desperate. *They may not pay much, but they do pay wages. "Hivemind: Where Have I Misplaced My 123,446 Metric Tons of Alumina?" BEIJING—The state-owned Citic Resources Holdings Ltd. said about half of the alumina stockpiles it had stored at China's Qingdao port couldn't be located, heightening concerns over the use of commodities for financing in the country. Citic Resources, a mining and trading company, said this month that it had applied to a court in Qingdao, a port on China's eastern coast, for help in securing metals it owns in warehouses. Citic Resources' parent is Citic Group, one of China's largest state-owned companies and a big financial concern. Citic Resources, in a statement released Wednesday to the Hong Kong stock exchange, said the court couldn't locate 123,446 metric tons of alumina, a mineral used to produce aluminum. Citic Resources said it stored 223,270 tons of alumina and 7,486 tons of copper at the port that was awaiting delivery to buyers. The company said it would now conduct its own investigation into the missing commodities. At current market prices, the missing alumina is worth about $50 million. Qingdao courts didn't respond to calls for comment. The statement came as Western and Chinese lenders are looking into suspected fraud in China involving metals that were used as collateral. Banks have lent hundreds of millions of dollars to Chinese commodities traders in recent years, using commodities such as copper, iron ore and aluminum as collateral. That's a lot of missing alumina. That said, it's all relative. If you take a Great Lakes freighter as an example, it seems that it's only the capacity of 1.5 shipments. Moss Landing, CA: Calera is a clean technology company doing electrochemistry; they're looking for a B.S. chemist with 5+ years analytical experience. Minneapolis, MN (? ): Valspar Corporation have 2 senior chemist positions; one aimed at coatings and a little more senior. The other is a little less experienced -- they still want a M.S./Ph.D. South San Francisco, CA: Genentech is looking for a small molecule pharmaceutics scientist; Ph.D., 0-5 years experience desired. A broader look: Monster, Careerbuilder, Indeed and USAjobs.gov show (respectively) 211, 970, 2,799 and 17 positions for the search term "chemist." LinkedIn shows 190 positions for the job title "chemist", with 3 for "organic chemist", 0 for "medicinal chemist", 1 for "synthetic chemist", 12 for "research chemist" and 15 for "analytical chemist." 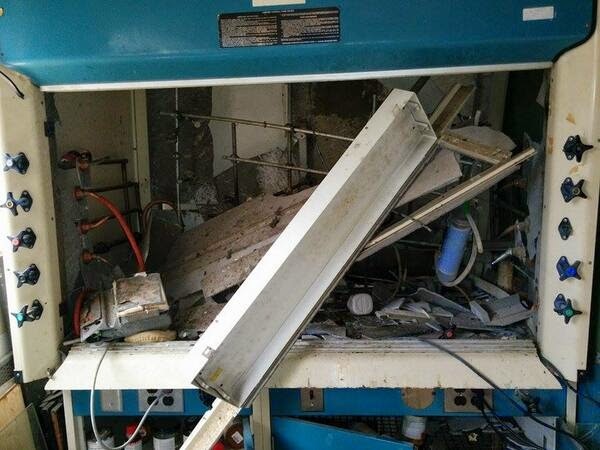 Yesterday, University of Minnesota chemistry professor Chris Cramer tweeted about an explosion within UMN's laboratories. Initial reports indicate that TMS-azide (MSDS here) was the culprit. The graduate student involved was both burned and hurt from shards of glass and appears to be recovering. As you can see, the damaged hood is pretty wrecked. A hearty "glad you're okay" and "best wishes" to the grad student who was injured. Stay safe out there, folks. During our inspection, the investigator observed that the [redacted] manufacturing workshop [redacted], used for [redacted] steps, contained significant particulate material, [redacted] fluid, and a plastic tube (apparently from a pen) in the bottom of the various [redacted]. These [redacted] were labeled as clean. The samples collected of the residues were insufficient to allow for an adequate investigation. You did not initiate an investigation prior to the investigator’s observation. Your investigation consisted of a high performance liquid chromatography (HPLC) assay test for [redacted], the last API manufactured in that [redacted], even though the sample was a complex mixture of [redacted] phases. You conducted no further testing, and disposed of the sample after the HPLC analysis. It's funny what gets into equipment sometimes. Oops. A fire broke out in a sodium (Na) packaging workshop at 6:45 pm on valves on top of a tank having a potential capacity of 52 t of Na which was fortunately empty at the time. This tank was located next to another tank containing 15 t of Na. These buffer tanks are pressurised at 7 bar in order to transfer Na to the chemical plant and the empty tank, which was to undergo regulatory ten-year testing, was in its final cleaning stage prior to being flushed with nitrogen. Three firemen emptied roughly twenty powder extinguishers located in and near the workshop, then threw 40-kg sacks of anhydrous sodium carbonate onto the two torches formed, but the fire was not extinguished. They then attempted to drain the oil system (4 m³) into a buffer tank, but the process could not be completed due to the geometry of the piping. External emergency rescue services arrived in several waves. Attempts were made to place a massive quantity of sodium carbonate on the fire, now several meters high, but were unsuccessful. Fire nozzles were used to project nitrogen on the fire in an attempt to rarefy the oxygen locally. A platform was installed on the tank at around 9:30 pm in an attempt to retain the carbonate. The system was finally purged 30 minutes later by means of a small pipe and the fire's intensity dropped rapidly. Although the fire remained contained, firefighting operations lasted 3 hours and 20 minutes. The considerable amount of heat generated ruptured part of the facility's roof made of eternit and damaged plastic elements at the centre of the workshop. At daybreak, an external rescue team member used a tarp to cover the sodium present in the hall. The fire was caused by the ignition of hot oil sprayed from a leaky seal. The leak was caused by excessive pressure in a thermal oil coil heated by exothermic hydrolysis of the residual Na in the tank in contact with steam from the cleaning operation. No notable pollution of the natural environment was observed. The operator undertook the following measures: modification of the tanks' ten-year review procedure (water replaced by a different fluid...), study of the complete drainage of the oil circuits, reorganisation of the internal emergency services (internal contingency plan). This looked like it happened in France in 1987 (search "Saint Marcel" in the document). I'm no expert on metal fires, but it sure seemed like they threw everything except the kitchen sink at this fire (fire extinguisher powder, sodium carbonate, nitrogen). I don't quite understand the full extent of how the incident happened; did they really use steam to remove residual sodium from the tanks? I assume there's some other solvent that could be used to avoid the use of steam as a cleaning solvent (I dunno, octanol or something.). Genentech has multiple exciting opportunities for PhD synthetic organic chemists to join our Small-Molecule Drug Discovery Chemistry Department, located in South San Francisco, CA research headquarters. The successful candidate will be responsible for designing and synthesizing analogs for molecular targets during the lead identification and optimization stage of drug discovery. Applicants must have 0-5 years of post-Ph.D. experience in Organic Chemistry, with an emphasis on organic synthesis. Post-doctoral experience and relevant industry experience is preferred. Ashton Scientific provides custom chemistry services for customers across a variety of disciplines. Ashton was founded with the belief that smart scientists working together in interdisciplinary teams could be more productive if they were given the ability immerse themselves completely in a single project, followed by ample time to recover. By providing downtime for our scientists, we allow them to recover and relax, while enabling us to respond quickly to our customers when necessary. I wonder what "downtime" means. Linwood, PA: Esschem is looking for a senior research chemist (5-10 years experience) oriented towards energy-curable polymers. Charlotte, NC: DyStar, L.P. is looking for a regulatory/compliance specialist. B.S. in chemistry desired. Nationwide Children’s Hospital in Columbus, OH is hiring someone with strength and experience in analytical chemistry to develop clinical assays for testing in one of the nation’s premiere pediatric hospitals. The Technical Specialist-Analytical Development is responsible for coordinating development of new assays, introducing new processes and procedures, and implementing those assays into clinical offerings. Master’s degree highly preferred or qualified Bachelor’s degree with considerable experience in sample preparation from biological matrices and experience with LC/MS/MS and GC/MS. The Department of Chemistry at Dalhousie University invites applications for two tenure-stream faculty positions. Preference will be given to applicants in the fields of synthetic chemistry, computational and theoretical chemistry, and analytical chemistry. Berkeley, CA: The University of California - Berkeley has posted a Chemical Lab Safety Specialist 4 position. Pay is pretty strong at 70-140k -- looks like a lot of safety certifications are important. Lynchburg, VA: Sweet Briar College desires a M.S./Ph.D. chemist for a position as a instructor/visiting assistant professor for spring 2015. Easton, PA: Lafayette College desires a visiting assistant professor for general chemistry instruction. Philadelphia, PA: Drexel University is looking for Last Minute Lecturers; they would be working as assistant teaching professors for general and organic chemistry, starting September 1, 2014. For one thing, state funding begets federal funding: Federal grants from the National Institutes of Health aren't given to schools; they are given to scientists, and if those scientists move, the grant money moves with them. Talent moves with these top researchers, too—“like a baseball player will help you win a pennant but they also put fans in the seats,” as Goldman put it. Jo Wiederhorn, president and C.E.O. of AMSNY, points to a 2010 study from Tripp Umbach, which estimates that for every $1 of investment, the state sees $7.50 of economic output. An example of how that works: In 2012, Weill Cornell Medical College poached Dr. Lewis C. Cantley, a professor at Harvard and Director of the Cancer Center and chief of the Division of Signal Transduction at Beth Israel Deaconess Medical Center. Cornell's pitch included its brand-new cancer center, with new labs and new equipment. But Cantley doesn't come alone. He brought a staff of post-docs and lab technicians, fellow researchers. Those are all good-paying jobs, and that staff needs a place to eat lunch, take its dry cleaning, etc. I should point out here that postdoctoral salaries are not poverty wages by any means, but I strongly disagree with calling them "good-paying jobs". At the very best, they're "temporary appointments that provide a modest income." Is there any evidence of big PI moves that have actually helped establish or cement a new institution's reputation? I'd like to think so, but I suspect that evidence is thinner than boosters would suggest. ...Weighing nearly 300 lb by the time he was a junior at the University of Toronto, [John] Janetzko knew that his years of unhealthy eating and leading a sedentary lifestyle were finally catching up to him. He felt miserable. A friend who worked in the same chemistry research lab noticed, and he encouraged Janetzko to join him at the gym. In the beginning, Janetzko could barely jog for 10 minutes, but he kept going. Meanwhile, he was also making much healthier choices in what he ate. Janetzko recently shared his weight-loss journey with CNN’s “Weekly Weigh-In.” Now a Ph.D. candidate in chemistry at Harvard University, Janetzko, 24, weighs a lean 170 lb, and the only weight he’s trying to gain is in muscle mass. He continues to work out regularly and has motivated others in his research group to do the same. As someone who gained (and then lost!) and then gained some weight in graduate school, it's pretty neat to see a story of someone who managed to go the other way. I think the establishment (if you didn't already have one) of an exercise routine of some sort in grad school is a really great way of promoting/preserving mental health. A key piece of information was absent from the article concerning students who manipulated their nuclear magnetic resonance spectra (C&EN, April 21, page 32). It has been policy for many years at all American Chemical Society organic chemistry journals that evidence of the purity of characterized compounds must be provided. The means suggested for meeting this policy are either a “clean” NMR spectrum or a high-performance liquid chromatography trace. This is necessary following the demise of elemental analysis to establish both elemental composition and purity. The article implies that the transgressions were fairly minor, but in fact, without manipulation of their data, these authors would have been unable to meet an editorial requirement for publication. These are serious breaches of integrity, and publishing corrections is a mild punishment. Apart from the lack of integrity on the part of those who manipulate spectra, it seems to me that the 'root cause' of this mess was the editorial decision that NMR spectra could be used to determine purity sufficient for publication. of the year, btw. Very creative. 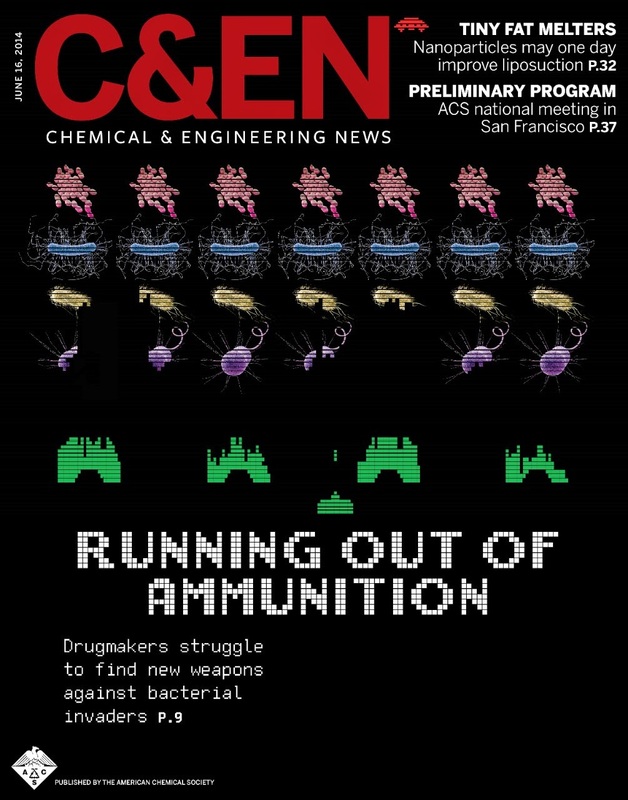 Really interesting cover story on efforts towards antibiotics in the pharmaceutical industry by Lisa Jarvis. I didn't realize the role that regulatory hurdles were playing -- dunno if that's pharma working the refs, though. What's been brought to my attention, though, is the difficulty in finding patients to perform clinical trials on -- I wonder if it's especially difficult for bacterial infections. An article by Alex Scott on the meeting of chemical industry representatives and environmental NGOs. The declarative statement by the Halliburton counsel ("asserted that “there has never been, not once,” a case against a fracking company that has succeeded in a court of law") is rather disturbing and evocative of the tobacco industry. The calutrons were initially operated by scientists from Berkeley to remove bugs and achieve a reasonable operating rate. Then Tennessee Eastman operators who had only a high-school education took over. Kenneth Nichols compared unit production data, and pointed out to Ernest Lawrence that the young "hillbilly" girl operators were outproducing his Ph.Ds. They agreed to a production race and Lawrence lost, a morale boost for the Tennessee Eastman workers and supervisors. The girls were trained like soldiers not to reason why, while "the scientists could not refrain from time-consuming investigation of the cause of even minor fluctuations of the dials". Responsibility for operation passed entirely to Tennessee Eastman after the spring of 1944, and the Laboratory staff at Oak Ridge turned their attention to redesigning the calutron system for higher efficiency. This analysis examines both descriptive data and time series data for all students in chemistry Ph.D. programs. Table 2 shows the results by department for total doctorates, growth in degrees granted, and the rank of each institution in size and growth. Institutions are listed by rank in average number of degrees granted. 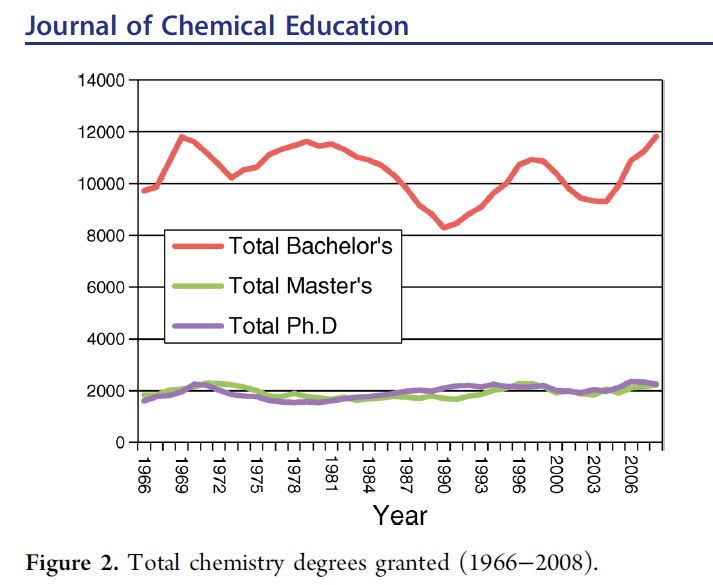 Figure 2 shows the trends in absolute numbers from the NSF database of chemistry degrees awarded per year, which indicate almost no growth in total chemistry doctorates or masters degrees granted since 1966. The number of bachelor’s degrees has fluctuated substantially over the years, but has shown little overall total growth. In the 50-school data set, the average number of doctorates awarded by each school (five-year average, 2005−09) is 25 and the average growth rate is two degrees over the entire 22-year sample period. While aggregate growth is small, it masks a large range of increases and decreases in total Ph.D.s granted by individual departments. Of the 50 departments, 29 showed a positive growth trend and 18 a negative trend; two schools showed no net change. Over the 22-year period, six departments grew by 10−20 Ph.D.s, and four shrank by over 10 Ph.D.s. We found only weak correlates to the magnitude of departmental growth; while there is a small negative correlation between the average size of a department over time (on one hand) and growth, this relationship was not statistically significant. It is possible that more departments showing a net long-term shrinkage exist but are outside the Top-50 data set; however, the overall trend in growth is consonant with growth from all schools in the national data. Those references are a National Research Council report from 2007 and our old friend the Carnevale/Georgetown "STEM" report. Suffice it to say that I disagree with them on that point. All in all, a worthwhile analysis, though. Derek is moving from Corante -- I just hope that the first 3 letters of the new home will also be "pip", so I don't have to change what I type into my browser. I don't really follow soccer/football at all, but I would really like the American sports media to quit using the term "Group of Death" every 4 years. The U.S. is mediocre at best at futbol and it doesn't have anything to do with random/semi-random pairings. (Reuters) - A federal agency sued a New York customer service provider on Wednesday after allegations the company forced employees to pray, thank God for their jobs and say "I love you" to managers and colleagues at work, and fired those who protested. The Long Island-based United Health Programs of America and its parent company, Cost Containment Group, required workers to practice a spiritual belief system called Onionhead while on the job, in violation of their civil and religious rights, the U.S. Equal Employment Opportunity Commission said in the complaint. The company fired several employees who refused to adhere to the Onionhead doctrine, which was created by the aunt of the company's owner, the complaint said. In one case, an IT project and account manager was disciplined after she complained to management in 2010 that she was Catholic and did not want to participate in the spiritual activities, according to the complaint. A month after she complained, the employee was removed from her office and relocated to an open customer service area, while a large statue of a Buddha was placed in her former office. She protested to the owner that the move amounted to a demotion and was fired, the complaint said. "While religious or spiritual practices may indeed provide comfort and community to many people, it is critical to be aware that federal law prohibits employers from coercing employees to take part in them," Sunu Chandy, senior trial attorney at the commission, said in a statement. Emeryville, CA: Novartis is hiring a Ph.D. chemist for an Investigator II position; looks to be entry-level (?) and oncology-related. Maple Shade, NJ: Emerald Performance Materials is looking for a M.S./Ph.D. chemist with 5-7 years of experience with thermoset resins. Also, a QC/QA chemist position (B.S. + experience) at the same facility. Lexington, KY: DSM is looking for an experienced B.S. chemical engineer; looks to be oriented towards purification technologies. A broader look: Monster, Careerbuilder, Indeed and USAjobs.gov show (respectively) 214, 960, 2778 and 14 positions for the search term "chemist." LinkedIn shows 165 positions for the job title "chemist, with 3 for "organic chemist", 0 for "medicinal chemist", 12 for "analytical chemist" and 11 for "research chemist." President Obama: "I'm putting a big emphasis on STEM in part because we have a shortage"
[E-mailed in question]: How can we promote growth in the STEM fields without putting humanities on the back burner? The President: Well, first of all, I want to say, I was a humanities major. So... I majored in political science, I majored in English. I was pretty good in math. I actually loved math and science until I got into high school and I misspent those years. And the thing about humanities was, you could talk your way through classes which you couldn't do in math and science, right? So a great liberal arts / humanities education is still critically important because in today's global economy, one of the most important skills you have is the ability to work with people and communicate clearly and effectively. Having said that, what is also true is that technology is going to continue to drive innovation and just to be a good citizen, you need some background in STEM. And we are not producing enough engineers, enough computer scientists, enough math teachers and science teachers, and enough researchers. And so I'm putting a big emphasis on STEM in part because we have a shortage, not because I'm privileging one over the other but because we don't have as many people going into the STEM fields. And it starts early. Part of what we're trying to do is work with public schools to take away some of the intimidation factor of math and science. Part of what we're trying to do is to make sure we're reaching to demographics that are very underrepresented. And, yes, I mean you, women. Girls are still more likely to be discouraged in pursuing math, science, technology degrees. You see that imbalance in Silicon Valley, you see that imbalance in a lot of high-tech firms. We're trying to lift up curriculums that are interesting for kids, work with schools in terms of best practices. One of the things that we're also discovering is that young people who have an interest in math and science, often times they're steered into finance because that's been perceived as the more lucrative option. And we're trying to work with universities and departments of engineering, for example, to help mentor young people to understand that if you look at the top 100 companies in the country, you've got a lot more engineers running companies than folks who have a finance background. So there are great opportunities. So that's one of the things that every young person should be thinking about: A) what's their passion - what do they care about? But they should also be taking a look at, where's there a demand? And frankly, if you've got a science or engineering background, the likelihood of you being unemployed is very low. And it doesn't preclude you from you know, writing haiku at some point and figuring out some creative outlet. But having that discipline and skill set is still going to be invaluable. The country is "not producing enough engineers, enough computer scientists, enough math teachers and science teachers and enough researchers." The country has a shortage of STEM workers. This shortage has to do with students being discouraged from thinking about STEM as a career path, especially women. This shortage is exacerbated by STEM students going into finance. If you've got a science or engineering background, the likelihood of you being unemployed is very low. Suffice it to say that my understanding of the bulk of the actual social science we have available is that there is little evidence of a shortage of engineers or computer scientists. I do not know enough about the number of science and math teachers in this country, so I can't speak to that. ...by the way, we have enough lawyers. It's a fine profession. I can say that because I'm a lawyer. We all have our own perspectives, I guess. He's probably talked to a lot of law school grads who've had trouble finding work than unemployed scientists. *Relevant section starts at 14:30, goes to 18:00. In the first report for Class of 2013 graduates, computer sciences graduates began the year with a healthy increase of 4.3 percent to their overall average starting salary. However, in the September 2013 and January 2014 Salary Survey reports, their average salaries dropped by 2.5 percent and 0.2 percent, respectively. In this April 2014 issue, average starting salaries appear to be making a comeback, as the overall salary for the group rose almost 3 percent to $61,741. Two individual majors within the computer sciences category posted increases as well, with the starting salary to computer science majors rising by 3.9 percent to $67,300, and the starting salary to information sciences and systems majors increasing by 2.3 percent to $58,400. engineering majors saw the highest increase of 9.1 percent, bringing their average starting salary to $61,400. Graduates in the math and sciences fields saw an overall increase. As a group, their average starting salary rose 1.6 percent to $43,414. Specific mathematics majors posted a small increase of 1.1 percent to their average starting salary, bringing it to $50,400. Physics majors, on the other hand, saw their average salary decrease by almost 5 percent to $40,600. Chemistry majors, the only other group that witnessed a decrease, posted a decrease of 2.8 percent, dropping its average starting salary to $45,000. Well, that's not good news. I wonder how the ACS starting salary survey for 2014 will look. I don't have a lot of experience with this data set, so I am not sure how much to believe it. ...Data contained in the NACE Salary Survey are produced through a compilation of data derived from the U.S. Bureau of Labor Statistics, the U.S. Census Bureau, and a master data set developed by Job Search Intelligence. Data for the April 2014 Salary Survey report were retrieved in February 2014, and were compiled using a proprietary methodology created by Job Search Intelligence. The April 2014 Salary Survey issue contains employer-based data from approximately 400,000 employers; gathered from government and other sources, the data are actual starting salaries, not offers. Thanks for sharing highlights from the recent “Science & Engineering Indicators” (SEI) (C&EN, March 10, page 29). I am a big fan of those reports and spent many hours analyzing the data in them in my past career in science policy. The statements about K–12 teachers in particular caught my attention because about one year ago I made the decision to change my career and become a high school chemistry teacher. I am now among the data—part of the 82% of high school teachers with a science degree (I have three, including a Ph.D.). I am also aware of the high percentage of teachers who quit in their first few years of teaching (especially those teaching secondary math and science), given that I am struggling to make it through my first year of teaching high school. I want my fellow chemists to know that teaching high school is an extremely hard job—harder than any job I have ever had. Teaching chemistry is about half of what I do; the other half involves keeping teenagers awake and on task in addition to endless administrative duties. On the other hand, becoming a high school teacher is a decision I don’t regret for a minute. I have some of the most supportive, hardworking, and dedicated colleagues (teachers and administrators) I have ever had and many wonderful students who keep me on my toes and put a smile on face at the end of every day. Although the SEI data are interesting and paint a rather negative picture of the status of K–12 education, I urge readers to look deeper at the individual data points. If you have been considering changing your career to teach high school chemistry, please know that it is truly rewarding, that you are needed, and that you will make a difference. You can do your part to help increase the percentage of teachers with science degrees and also hopefully decrease the percentage of teachers who leave within the first few years of teaching. I think Dr. Masciangioli makes an interesting point -- that if you become a high school chemistry teacher, lots of your time will be spent managing behavior of teenagers. I'm not sure that I would be up for that, to be honest. The last time I was engaging teenagers, I found myself more irritated than anything else. Nevertheless, "truly rewarding", making a difference and being needed are all things that make for a happy career -- I'd say that this is a pretty strong endorsement. ...Beyond initial meetings and verbally setting expectations, PIs follow up with their groups in different ways. One approach is to stay aware of the experiments people are doing and use the opportunity to discuss experimental techniques. “The first time someone is going to use sodium metal, I’ll talk with them about different ways of handling it,” says Craig A. Merlic, a chemistry professor at the University of California, Los Angeles, and chair of his department’s safety committee. Some professors make students write out an experimental protocol or emergency response plan. “Especially if they’re a first-year graduate student, I’ll tell them to write out for me a plan for waste disposal and what they’ll do if they spill to make sure they’re aware of the hazards,” says Scott E. Denmark, a chemistry professor at the University of Illinois, Urbana-Champaign, who is leading an effort to improve his department’s safety culture. And some faculty do experiments with students one-on-one. “I’m very much a mother hen at least for the first couple of months. I go through every single procedure in the lab with my students,” says [Texas Tech professor] Casadonte, who chairs his department’s safety committee. Even PIs who aren’t as hands-on as Casadonte keep vigil over their labs. “I stick my head in everybody’s hood when I go through the lab,” Denmark says. If he sees a setup he doesn’t like or someone using glassware with a broken edge, he’ll discuss it with them. He also makes sure everyone is wearing lab coats, eye protection, and other protective wear, and he will flag things like a solvent bottle sitting on the floor. Personally, I think pointed comments from The Boss (whoever they are) are pretty effective in making sure that safety rules are followed. Read the whole thing! Lost in translation: No, Cambrian Genomics does not "3-D print DNA"
WSJ: Talk a little about startups in manufacturing. MR. BASS: You see the ability for very small companies to compete in ways that were never imaginable before. I'll tell you about one company called Cambrian Genomics. They built a machine that 3-D prints DNA. So if you were a scientist working in a lab and needed DNA to do your experiments, you would send them a text file with the description of the base pairs, and you would send them this description and they would send you back a vial. This is real biological printing. This company has less than 12 employees, and has done it on raising a single-digit number of millions of dollars. But the new process that Cambrian Genome [sic] created speeds up that process exponentially by using laser printers to sort the DNA making it significantly quicker and more affordable. How affordable will it be? The DNA laser printer will produce more viable DNA in a single run than is produced in all of the machines in the entire world in a single year. To overcome that problem, Cambrian synthesizes large volumes of oligonucleotide fragments on microarrays, then uses massively parallel DNA sequencing to sort the different DNA variants and identify those with the desired sequence. Then, says Cambrian founder and CEO Austen Heinz, "we use laser catapulting, also known as laser-induced forward transfer, to eject clonal DNA populations," which were identified as having the desired sequences. The process is a variation on laser capture microdissection , which can excise part of a cell and move it to a desired location without damaging DNA. High-speed laser pulses then eject beads carrying the desired sequences in the right order to assemble into genes on a 384-well plates, as shown in the diagram. Assuming this is an accurate explanation, it's using laser technology to sort solid-phase DNA faster. That's quite useful, but it is neither "3-D printing DNA" nor "laser printing" it. Not that anyone cares -- whatever gets the investors' juices flowing, right? This person is responsible for the fabrication of polymeric membranes, completing separation experiments, and characterizing the results using different spectroscopic techniques. Experience with polymer chemistry, membranes, and separations is highly desired. Bishop, TX: Celanese is looking for a production chemist; looks to be a B.S.-level position, 3+ years industrial experience, instrument experience desired. Shawnee, KS: Bayer Animal Health wants to hire an experienced M.S./Ph.D. chemist (4-6 years experience) to be a R&D project manager; 95-130k offered. Not bad for the area, I'm guessing. A lab worker at Texas A&M University at Qatar died last week after an incident in the engineering building, according to a statement by Mark Weichold, dean and CEO of the school. Some sort of explosion in the lab killed petroleum engineering lab technician Hassan Kamal Hussein, who is survived by his wife and four daughters, reported the Daily Q, a student publication at Northwestern University in Qatar. Condolences to the labmates and family of Mr. Hussein. Ask CJ: when to tell prospective employers about being laid off? You're working at Company A, but informally talking to a representative of Company B about opportunities there. Company B is interested in you. Company A lays you off, for economic reasons. When do you tell Company B? I assume that the answer is "as soon as possible", especially if your supervisors/directors at Company A are willing to vouch for you. Readers, what do you think? Can anyone make the case for not telling until you have to? Ask CJ: Is it worth it to pay for LinkedIn Premium? Did they get chemistry jobs as a consequence of forking out for LinkedIn? How much experience did they have? What was their area of specialization? Which job market were they aiming at: industrial, academic or government? I think the general answer is "no", there aren't very many people who have paid for LinkedIn Premium, but I dunno. I sure haven't. Readers? We admit that things are moving very quickly at present because of the short time until the meeting but we believe that the Open Science field, in particular, is fast-moving, flexible and more than willing to assemble to honor JC and discuss Open Science. The day-long meeting is on Monday July 14th and registration has just opened up so please do sign up to attend. A symposium page has been set up here by Andy on the InMemoriamJCB wiki and this will be updated regularly as we get the list of speakers squared away. If you are interested in contributing a talk please contact me offline at tony27587ATgmailDOTcom. We are presently assembling titles and abstracts and will start listing them shortly. We are working on this in our off hours (early mornings and evenings) so please bear with us through the crunch of bringing this gathering together. Process Wednesday: how to measure reactor volume? How about radar? Ultrasonic level measurement depends on a transducer sending an ultrasonic pulse to the liquid surface which is reflected back to the transducer. Electronics convert the ultrasonic lag time into a distance corresponding to depth... Although ultrasonic level indicators require little maintenance and are unaffected by the nature of the liquid (acidity/basicity, dielectric constant, or specific gravity), they cannot be used in circumstances of excessive foaming or turbulence or in high-temperature situations where stratified vapor layers are present. On the other hand, radar detectors can be used in vessels exhibiting a wide variety of conditions: Radar energy passes through air or vapor space with imperceptible changes. The greatest limitation to the use of radar detectors is price, because of the complexity of the microwave and timing circuitry. In an advanced measurement unit, the radar level gauge sends out a continually swept microwave signal with varying frequency. The transmitted signal is compared with the signal sent back in a microwave mixer device, the difference in frequency being directly proportional to the distance. It will be obvious that high-quality signal processing is necessary since the liquid surface in a working reactor is never calm and unwanted echoes within the reactor need to be separated out. Pretty: I see that C&EN Jobs is changing its search box and adding some new tabs. It looks nice, and I note that a lot of the pfaff that has cluttered up the stream recently (the 14,000 irrelevant Pfizer positions, the hospital clinical chemistry jobs and the private high school science teaching positions) have gone away. An improvement, for sure. Irving, TX: ITW Polymers Sealants North America is searching for a B.S./M.S. polymer chemist (3-7 years experience desired.) 70-100k offered. Austin, TX: Sapling Learning is hiring 2 writers for its chemistry online learning team; B.S./M.S. in chemistry desired. Manage products globally throughout their lifecycle by gathering and prioritizing product and customer requirements, defining the product/product line vision and working with internal departments and/or external parties. Achieve product revenue, profit and customer satisfaction goals by working closely with customers, sales and marketing support teams. Ensure that the product and marketing efforts support the company’s overall strategy and objectives. The salary offered for this magisterial position? 66-73k. Wow. Collegeville, MN: The College of Saint Benedict/Saint John's University is hiring a one year chemistry instructor to start in August 2014. When is mosquito season up there, anyway? Research areas of interest include, but are not limited to, functional biomaterials, catalysis, energy harvesting and storage, efficient syntheses and processes, and plant bioengineering and synthetic biology. Opportunities for significant interaction with and support from the Institute for Paper Science and Technology at Georgia Tech (ipst.gatech.edu) will be available. Albuquerque, NM: The University of New Mexico is searching for a manager for its nanofabrication facility. Sounds fancy, you could have some green chile stew along the way. This position will provide excellent professional development opportunities for talented candidates interested in pursuing a career in instrumentation management. *I'm sad there's not a 'deputy' or an 'associate' in that title.